Romantic, delicate and delightful are the perfect words to describe this enchanting hair clip. Featuring a medium size barrette, crafted in silver plated metal and decorated with a double butterfly motif. 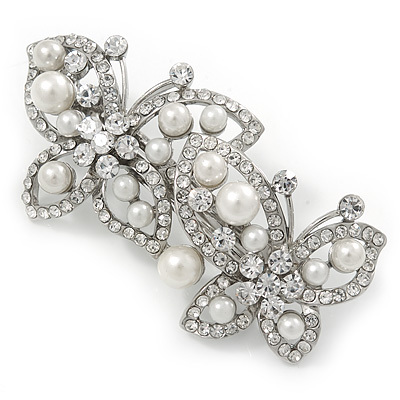 Each butterfly encrusted with white glass pearl and clear Austrian crystals. It measures about 70mm across and 30mm in width. Secures with an excellent sprung steel mechanism. This looks just divine worn pinned at the back of the head to hold hair half-up half-down. For brides who adore vintage romantic style, this would be an exquisite wedding hair clip as well as a very pretty bridesmaids hair accessory. Suitable for medium to thick hair.